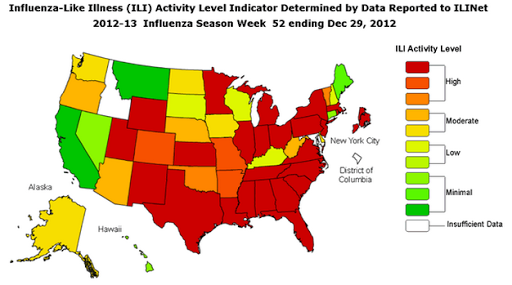 Today, January 9, 2013, we are the peak of influenza activity in the United States. 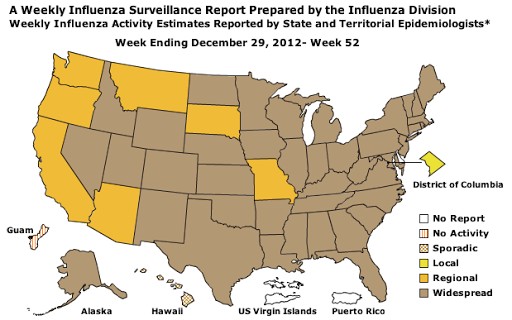 Places like Boston, Chicago, and North Dakota are seeing a surge in cases of influenza. The Centers for Disease Control and Prevention (CDC) is reporting that flu activity is widespread and intense in most of the nation. 1. The flu likes unvaccinated people. While there are some people who will get the flu eventhough they’re vaccinated, comparing apples to apples, people who are not vaccinated have a higher risk of getting the flu. There is an injectable vaccine and a nasal spray vaccine. The evidence seems to point to the spray being better for children and the injection being better for adults, while older adults need the high-dose vaccine. So get your flu vaccine, and get it each year. The flu likes to mutate, a lot. And, no, you can’t get the flu from a vaccine. If you do, you would be the first person in the world to do so, and scientists would like to talk to you. 2. The flu likes dirty people. The flu vaccine makes it harder for the virus to make you sick if it infects you. It doesn’t act as a magical barrier that keeps the virus off of you. To do that, you need to wash your hands, and wash them well. A simple rinse and go will not do. By washing your hands often, you minimize the chances of catching the flu from all the surfaces you touch during the day. When you touch a surface with the virus on it and then you touch your nose, mouth, or eyes, you have a good chance of getting infected. If you’re a food handler, you have a good chance of making a lot of other people sick if you don’t wash your hands well. That would be embarrassing. 3. The flu is deadly. Most of us will get through the flu just fine because most of us are otherwise healthy. We’ll feel bad for a few days and then recover with no lingering problems. This is not the case for people who have underlying medical conditions, and there are more of us with those underlying conditions out and about nowadays. What are those conditions? They include diabetes, pregnancy, asthma, cancer, heart conditions, lung conditions, even neurological conditions. This is why it is important for people who can be vaccinated to get vaccinated, and for everyone to wash their hands. Doing this protects people who are too weak or too sick to protect themselves. To date, according to CDC, there have been 18 deaths in children. That’s 18 too many, especially in an era where the flu is completely preventable with vaccination, hand hygiene, and social distancing. 4. The flu likes friendly people. Ever wonder why the flu is so active in the winter? One of the reasons is that people tend to pack into tight spaces in the winter. We do this almost automatically to get away from the cold weather. (The cold, dry air also helps the flu survive longer in the environment, so that’s a double whammy.) We pack ourselves into movie theaters, malls, schools, and at work, and we share the virus with everyone. So, if you are sick, stay away from crowds. If you want to increase your chances of not being sick, vaccinate, wash your hands, and stay away from crowds. (I don’t mean for you not to shop, but do it as off peak hours, online, or in places that are not too crowded.) If you must take the train in a crowded car, stay away from people who look ill and wash your hands as soon as you get to your destination. 5. The flu is inside you long before you know it. It takes between one to two days for you to feel the signs and symptoms of the flu once you’ve been infected. But here’s the kicker: You’re infectious one to two days before symptoms as well. That means that you can be completely healthy and be spreading the flu around. This is why quarantines generally fail when it comes to the flu if you base those quarantines on signs and symptoms. A perfectly healthy-looking person can make it through a checkpoint and be infectious. So, if you know you’ve been exposed, stay away from people who are susceptible to serious complications form the flu, complications like pneumonia and death. Now that you’re armed with knowledge, you’ll be more likely to make it through the flu season, no colloidal silver or magic required. Good luck. I’ll see you on the other side. There is this book called “Your Baby’s Best Shot“. 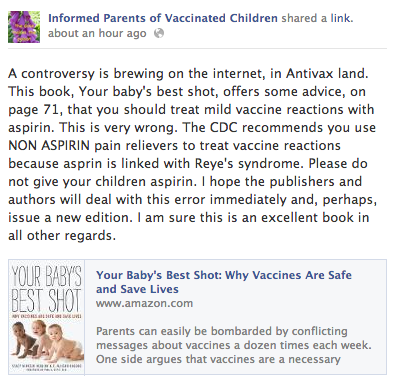 It’s a book about childhood vaccines and their benefits versus their perceived dangers. It’s pretty good, but it’s not perfect. In one of their pages, the word “free” is missing from a statement. The statement reads like the authors are recommending “aspirin” instead of “aspirin free” fever reducers. We’ve known for a while that aspirin and kids with fevers don’t get along because there is an increased risk of a condition called “Reye’s Syndrome“. It’s a serious condition that can be seen with viral infections and the administration of aspirin. The aspirin doesn’t cause it, necessarily. It does increase the risk of it. Yes. I make mistakes too. We all do. Unlike anti-vaccine people, and other unsavory characters, I try to spread out my mistakes throughout my lifetime, not concentrate them in one single anti-vaccine blog post. I knew a girl in high school who had it when she was ten years old. She had a lot of trouble walking after it. Very bad. Her followers may very well be frothing at the mouth. 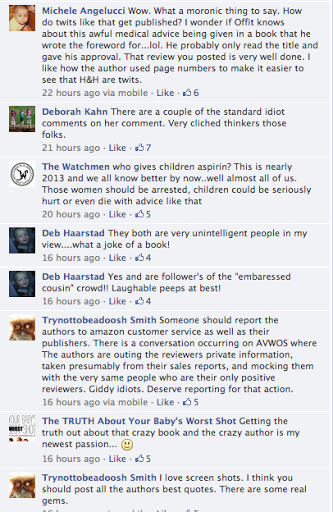 To please them even further, Stacy went and created a whole new Facebook page aimed at the book and its authors. Medical coders have so much time on their hands. The way you look at the timeline of events, the only reason Stacy learned of the error was from “Informed” writing about it, all the while “Informed” is just writing about it out of concern. The same rule does not apply to all the lies and misinformation in anti-vaccine books and publications, of course.